Good Tree for a Bunny is a little piece of whimsy - fun for me to paint and I'm happy to present it for you to bid on. This small painting is 2.5" across and 3.5" high and has a 1.25" off white alpha mat around it, bringing the overall size including the mat, to 5" wide and 6" tall. A nice little interesting watercolor with some pen and ink accents! Bidding on Ebay to start at only $19. Click here to find this item on Ebay! 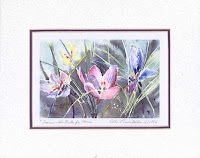 I've just added one of my signed prints - Crocus, the Butterfly Flower - t o this blog and also to Ebay. This is one of our most popular images, and a great reminder that - as the song goes - "Spring is just around the corner!" The image on this print is 6" across and 4" tall. The matted size is a standard 10" x 8" - making it a breeze to frame. The top mat is a soft light gray with a narrow purple mat under, a big favorite of mine. Ward and I have the original of this painting on a small easel atop a little butternut antique chest in our dining room. Bidding on this signed print starts at $10.00. Click here to find Crocus, the Butterfly Flower on EBay. Am very excited about a new studio easel that should be delivered later today. It looks a like a small drafting table with a built in large adjustable drawing board in the center and a flat working space on each side. This will make it easier for me to paint because I can change the height and angle to what is most comfortable for me. With our extended family and friends, there are plenty of birthdays to keep track of. Son Michael's is later this week so his card is ready to mail. Ward is finishing the framing on Grandson Michael's painting (shown to you on an earlier blog) and we will ship to to him soon- his birthday is later this month. Last night I worked on a small barn painting and hope to finish it within the next week. As soon as my new easel is set up, I'm going to finish work on a commissioned lake home painting and enjoy starting the next one! The little originals that we are putting on Ebay are stirring up my creative energy and freshening up my painting. And remember, I'll continue to enjoy creating these little gems right here in my gallery. There's pleasant jazz in the background and a chair for you to sit on. You are welcome to watch and chat while I paint. If you want to make a special trip to our gallery, please call first to be sure that we'll be here. We don't want you to be disappointed.